Nine governors of the ruling Peoples Democratic Party on Tuesday shunned the inauguration of the Presidential Campaign Organisation of the party in Abuja. 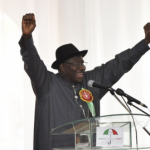 The organisation, headed by a former National Chairman of the party, Senator Amadu Ali, is saddled with the responsibility of selling the candidature of President Goodluck Jonathan and his deputy, Alhaji Namadi Sambo, to Nigerians for the February 14 presidential election. But only a handful of the governors were in attendance. Among the governors at the event were Emmanuel Uduaghan (Delta), Gabriel Suswam (Benue), Isa Yuguda (Bauchi), James Ngilari (Adamawa), Babangida Aliyu (Niger) and Ibrahim Dankwambo (Gombe State). However, governors Theodore Orji (Abia), Dr. Olusegun Mimiko(Ondo), Sullivan Chime (Enugu), Seriake Dickson (Bayelsa), Martin Elechi (Enugu) were absent from the inauguration. Also absent at the inauguration were governors Idris Wada (Kogi), Ibrahim Shema (Katsina), Sule Lamido (Jigawa) and Jonah Jang (Plateau). One of our correspondents saw many of the party bigwigs discussing the development, especially when some of the absentee governors were put in charge of the campaign in their zones. Lamido is saddled with the responsibility of coordinating the presidential campaign in the North-West, Mimiko is in charge of the South-West while Orji is to head the South-East zone. No reason was given for the absence of the governors. However, the President later met behind closed doors with the PDP governors at the Presidential Villa, Abuja. The meeting, which was also attended by ministers from states where the PDP was not in charge was meant to strategise ahead of the presidential campaign. The parley was held immediately the President and the governors returned from the Legacy House, Abuja where his campaign organisation was inaugurated. Some governors such as Chime and Elechi who were not at the PCO inauguration, also attended the meeting. The Chairman of the PDP Governors’ Forum, Akpabio of Akwa Ibom State, later told State House correspondents that the President had made the governors the coordinators of his campaign in their respective states. Akpabio boasted that despite the noise from the opposition, the PDP would win at all levels. While saying that the PDP would not rig the forthcoming elections, the governor claimed that it was the All Progressives Congress that could attempt to rig the election. “There cannot be failure. The PDP will surely win this election at all levels. PDP does not rig. We can only be afraid that the APC, the way they are going, will be the ones that will attempt to rig us out,” he said. Meanwhile, members of the president’s campaign organisation led by Ali, swung into action as they held their inaugural meeting at the old Banquet Hall of the Presidential Villa, Abuja.